The Multicorn project makes it possible to write Foreign Data Wrappers for PostgreSQL in Python. Installing PostgreSQL 9.2 is easy as it's available in the PostgreSQL Yum repository. Unfortunately Python 2.7 is not included in RHEL6. And replacing the 'system' python is a bad idea. The solution is to do an 'altinstall' of Python. The "--shared" and ucs4 options are required. The altinstall will install a python binary with the name python2.7 instead of just python. This allows you to have multiple python versions on 1 system. This will result in a /usr/local/bin/python2.7 which doesn't work. This is due to the fact that the libraries are installed /usr/local/lib, which is not in the library path. This can be solved by modifying the library path. Installing with PGXN will not work as this commit is not yet included. So we'll have to clone the git repo. The step to set the PATH is not in the Multicorn documentation, but it's needed as pg_config is not in our path. The sed line is needed to force the use of python2.7 instead of python (which is 2.6). And then we can load the extension in the database. 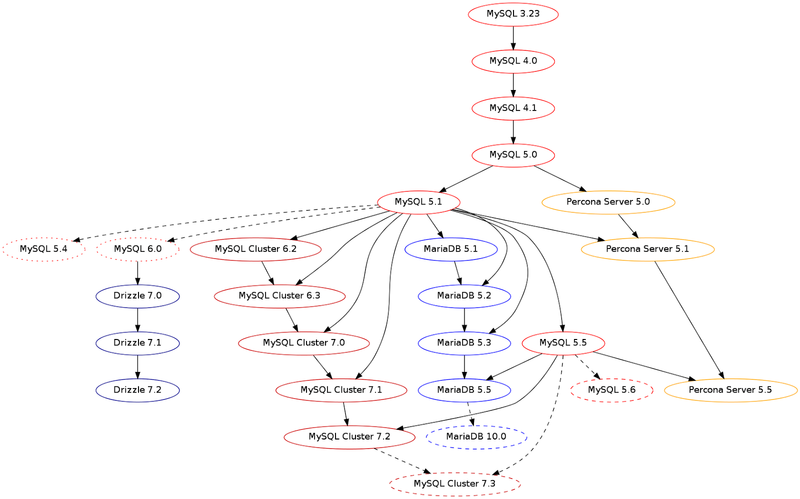 ERROR: Error in python: """
I've created a graph about the MySQL version history. Please let me know if this is correct or if I'm forgetting some versions.